In a bowl, combine the P.A.N. flour with the salt. Add water and mix well. Knead the dough for a few minutes, until the dough has a good consistency and doesn't stick to your hands. Cover and allow to rest for 5 minutes. Heat a pan or griddle to medium heat. Shape the flour into four balls and flatten into thick tortillas using your hands. Cook them on a griddle or frying pan, making sure that they don't burn. After a few minutes, turn them over to cook the other side. Remove them from the pan, put them on a plate and cover with a dry cloth. Sauce: While the arepas are cooking, prepare the sauce by combining all of the ingredients. Scrambled eggs: Heat a frying pan with a tablespoon of oil over medium heat. In a bowl, lightly beat the eggs, adding quinoa, salt, and pepper. Pour the eggs into the pan and cook, stirring until they're cooked to your liking. Pulling it all together: Cut the arepas in half, as if you were making a sandwich. Fill them with the eggs, and put a tablespoon of the sauce on each serving. Add some sauce on the side so that each person can use as much as they'd like, and serve with a good cup of coffee. 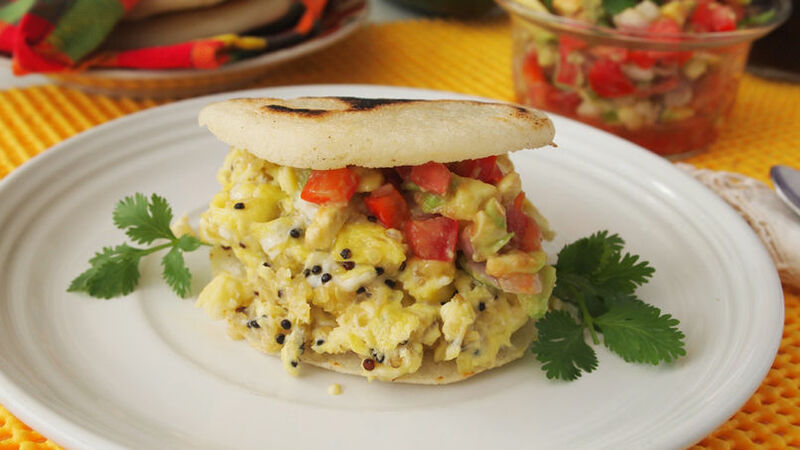 Instead of scrambled eggs, you can fill the arepas with fried eggs. Chop up some ham and cheese and add them to the eggs before cooking. If you wish, you can add a tablespoon of grated parmesan cheese to the arepa dough. Arepas are a staple dish in Colombia and Venezuela. They look like thick tortillas, and they're made from corn, though the flour's texture is a little different from the texture of normal corn tortilla flour. Another difference is that there is salt in the dough, and arepas can be grilled, fried, or baked. For breakfast, they're delicious stuffed with scrambled or fried eggs, and you can also fill them with cheeses or ham and cheese, shredded chicken, or anything you like. Serve arepas with a cup of coffee. Of course, they're just as delicious for lunch, as a snack, or even for dinner. In Venezuela, they're served with a sauce called guasacaca which is incredible. But, I like making a sauce out of chopped tomatoes, onions, black pepper, bell peppers, and avocado, to go with these delicious arepas. Yum! The final touch is cooking the scrambled eggs with a little bit of quinoa to make them unique and even more flavorful. Try them, I'm sure you'll love them!